Get the facts on HIV. There have been enormous advances in what we know about HIV-1 over the last 20 years. What's being done today to help patients with awareness, support, and advocacy is truly inspiring. Use the following resources to start building your own resource network. *Eligibility: Available to patients with commercial prescription insurance coverage for NORVIR who meet eligibility criteria. Copay assistance program is not available to patients receiving prescription reimbursement under any federal, state, or government-funded insurance programs (for example, Medicare [including Part D], Medicare Advantage, Medigap, Medicaid, TRICARE, Department of Defense, or Veterans Affairs programs) or where prohibited by law or by the patient's health insurance provider. 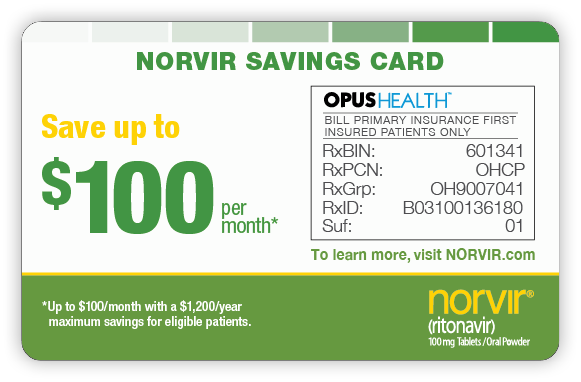 If at any time a patient begins receiving prescription drug coverage under any such federal, state, or government-funded healthcare program, patient will no longer be able to use the NORVIR Savings Card and patient must call OPUS Health at 800.364.4767 to stop participation. Patients residing in or receiving treatment in certain states may not be eligible. Patients may not seek reimbursement for value received from the NORVIR Savings Program from any third-party payers. Offer subject to change or discontinuance without notice. Restrictions, including monthly maximums, may apply. This is not health insurance. Please see full Terms and Conditions. †By texting "SAVE" from your phone to the above number, you confirm that you are 18 years of age or older and consent to receive recurring text messages from AbbVie, including service updates, medication reminders, and marketing messages. Message and data rates may apply. Your consent is not a condition of receiving goods or services. You can reply HELP for help or text STOP to unsubscribe at any time. Reference: 1. NORVIR [package insert]. North Chicago, IL; AbbVie Inc.